The Midwest Clinic - Supercharge your Brass Players! Clinic Synopsis: Supercharge Your Brass Players: Easy and quick strategies that will bring more power, endurance, and range to your brass players, including breathing techniques and embouchure development exercises. The presenter will play Rimsky-Korsakov's Flight of the Bumblebee, Spain by Chick Corea, Ashokan Farewell by Jay Unger, and other pieces. Clinician Biographical Information Frank Gabriel Campos is a renowned classical and jazz soloist and the author of Trumpet Technique (Oxford University Press, 2005), regarded the best single source on the subject. His popular 'Clinic' column in the International Trumpet Guild Journal has been an important pedagogical voice to thousands of trumpeters around the world since 1995. 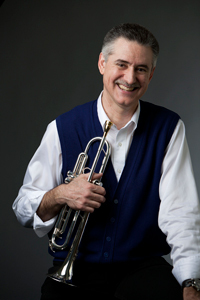 Currently professor of trumpet at Ithaca College’s Whalen Center for Music, Campos earned his bachelor’s degree from California State University Fresno and did graduate work at the University of North Texas where he won the Outstanding Masters and Outstanding Doctoral Student Awards, as well as the Hexter Prize for Outstanding Graduate. His primary teachers include John James Haynie, Leonard Candelaria, Don Jacoby, James Stamp, W. Ritchie Clendenin, Carole Klein, and his father.